I was writing a review of this album for another blog, and I was just impacted by the words of this song. Wow. What a beautiful picture of what worship is and what His presence is like. The presence of God breaks all our chains. Our hate, fear, pride, loneliness, anger, depression, lust–all of our chains are broken by His presence. His love is enough to rush in and overtake those sins, those chains, and make them fall. Freedom reigns in His presence. If those words aren’t comforting, I’m not sure what is. Just those 2 sentences also give me a picture of the POWER of God. Simply His presence breaks those chains. 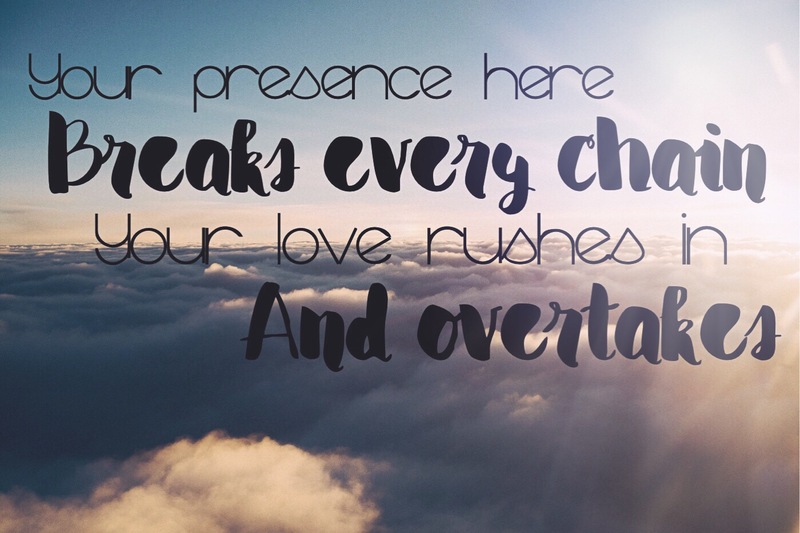 Simply His LOVE can overtake. I can’t even imagine what heaven will be like–when we are actually knelt before His throne. I want this to be an example of my life. I pray I will continually ask God to stir my heart for more and more of His presence. We should long for more of Jesus; daily-every moment. I never want to get tired of being in His presence. These words have resonated with my heart and mind. God brings freedom and love. No chains can keep us from Him. The bridge talks about what happens in His presence: the thief belongs, the blind sees light, the mute sing out!! All because of Jesus. All because of what He did for us. Sometimes, it’s hard to find the exact words to describe the spirit of God in a song and that’s the case for me right now. Listen to this song and let the words wash over you.